Groomers at 3 months old! Ear question! She's fresh from PetsMart groomers. They're so good (a little uneven but I can't complain). She's posing all nicely for the camera, at 12 weeks officially (: Should I be concerned that her ears aren't all the way up yet? Will they eventually get there or is she a case of "special"? Re: Groomers at 3 months old! Ear question! Sorry about the size, here's a bigger one. First you shouldn't have cut her fur, who told you to do that? The ears won't go up on their own, they may never even if you brace them up with tape and cardboard or any other solid material. If she has long fur around her ears that may help. I wouldn't worry about the ears even though it is a fault in the show ring it doesn't matter if she's a pet. What a nice haircut! And about the post above, there is nothing wrong with giving your chow a haircut. As long as you don't leave her outside 24/7 (she'll get sunburn) she'll be fine. Also, if your chow likes to swim, having shorter fur will help her out a lot! Please don't worry about her ears. She is beautiful the way she is. The ears do go up on there own. I am not for sure of the time frame of this. I know this question has been raised before so you could do a search and find this information previously posted. I have heard of a few instances where they may not raise. Last edited by oceans on Fri Aug 10, 2012 6:35 pm, edited 1 time in total. 612 has it right. Chows should not be clipped. They have a dual layer coat that acts as an insulator. It provides warmth in colder weather and a/c in heat. And at 3 months, the adult fur hasnt even come in yet. Puppy fur provides its own special protections. Based on the pics, the ears will remain floppy. 612's post was (i think) meant as demonstrative. That is, even with help, the ears will remain flopped. 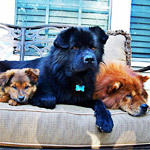 The triangle shape is correct for chows, but it is a fault for showing (only), if they dont stand. She is still a great looking pup. There's a chance your pups ears could still go up. I've seen pups who's ears looked like your pup's and stood up over time. Just be patient and give them time. And everyone else is right about the coat clipping it should NOT have been done. I have been told shaving down to the wooly under coat is OK in hot and humid climates or for skin problems. My Zoey had to be shaved for spinal surgery, it has almost grown back after seven months. I guess this is a topic for argument. Keep those ears clean with a Vet supplied drying type ear solution, I use Epi-Optic. I live in the tropics and I don't clip or even shave. I brush every day to remove dead fur. 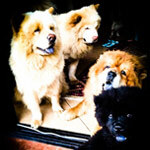 There is a reason for the thick fur of Chows. Actually if you brush correct it isn't thick but fluffy. It is a perfect insulation for UV. And a chow with mane just looks better, no offense but why going against mother natures design, we humans always want to know better and screw it up ultimately. 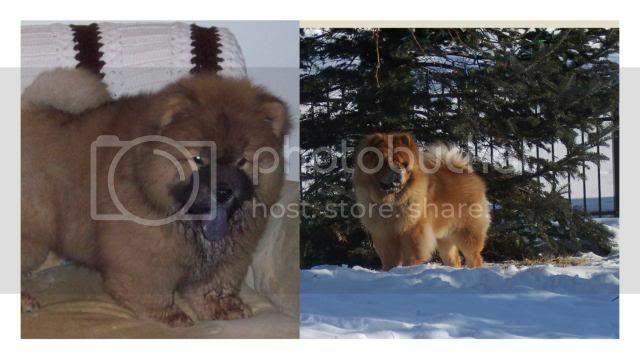 What is the ideal age to clip a chow's fur? 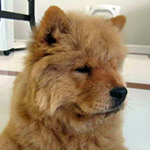 Aileen wrote: What is the ideal age to clip a chow's fur? You should NEVER clip a chow's fur. It damages their coat. there is no right age to clip a chow's fur to bare skin. But if you wish to trim like clipping a few millimeters or one centimeter off their coat, it doesn't hurt at all.